I usually do not put out fall decorations inside my house, but this year I decided to do some decorating in my living room. I was inspired because of all the blogs I have been visiting and looking at their fall home decor. 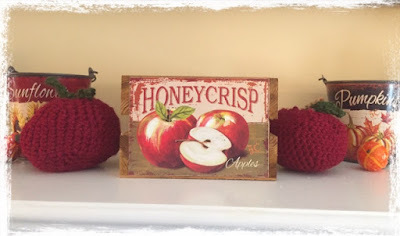 I was determined this year to decorate my mantel with crocheted apples that I wanted to make. If you would like to visit my post on how to make your own crochet apples you can visit my blog post HERE. The other items I bought at Michael's craft store and I enjoyed picking them out as there were so many to choose from. I thought they blended in well with the crocheted apples. 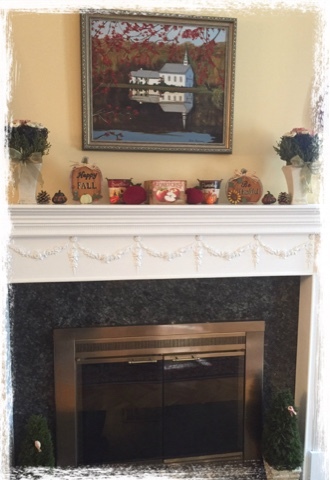 This is my fall mantel and the church painting was made by me many years ago when I was a teenager and I had taken many painting lessons. I love this fall scene and the colors of the trees. 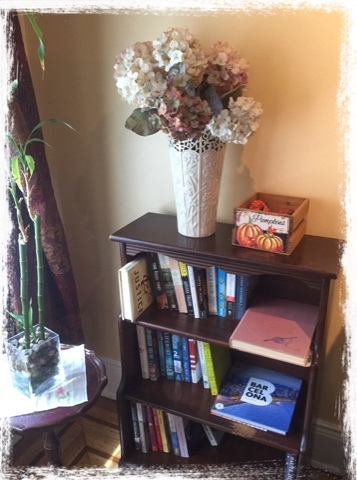 On this small bookcase I have displayed a pumpkin crate with small pumpkins inside. The hydrangea's are not real, but I love the way they look in the vase. I will be mixing in with these decorations my crocheted pumpkins I made. 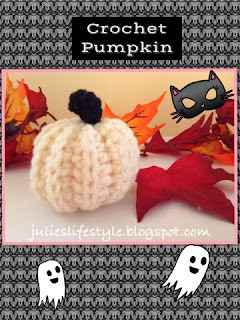 To see my mini crocheted pumpkins and to make your own in time for Halloween, you can visit HERE. I hope you enjoyed looking at my mantel decorated for fall and soon it be ready for Halloween and Thanksgiving. It all looks wonderful, Julie. And your fireplace/mantle is beauitful. Happy Fall to you! Have a great weekend. The mantel is looking good, Julie, with your crocheted apples! Love the honeycrisp sign, too. And the painting is very impressive! I love your apple!! I held back on my fall decor this year so I would not have so much to put away the day after Thanksgiving!! What a pretty mantle, Julie! My favorite part is the painting that was done by YOU!! Beautiful!!!!!!! I love your crocheted apple! Love your decorations for Fall!! Oh Julie, your autumn decor is so charming and lovely. You have created a beautiful fall atmosphere in your home. Happy weekend! Hugs! I love Fall decor! Looks so cute Julie. I'm just getting into the fall mode. I love the idea of decorating the mantle for the season. Somehow our mantle looks the same all year except for Christmas! You've inspired me! Love how you decorated your mantle! And I saw your pumpkin box on IG - it is adorable! Those crocheted apples, steal the show! It looks great and ready for fall. Looks so pretty! I love your mantel and fireplace. Fall is one of my favorite times to decorate but I do mix it up a little for Halloween and Thanksgiving too. Great job! That painting is wonderful! Hi Julie, Oh my word, your painting is beautiful, and your lovely apples. You are one talented lady! =) Happy Weekend! It looks great! I need more fall decorations, it turns out almost everything I have is Halloween! Brr... October already! Those are pretty little things on your mantel. Thank you for stopping in ~have a nice weekend! Julie, your fall decor is beautiful. I haven't decorated my home for fall yet; here in California it still feels like summer. Hopefully, the weather will turn fall-like soon. festive and pretty. Love your painting of the church, so beautiful. Love the apples and pumpkins you made they look terrific. Your painting is beautiful - good job. Your mantle is very pretty. Your mantel has so much old-fashioned charm to it. And your painting is really lovely! Julie, your apples are so cute and you picked some fun things to coordinate with them. Love your church painting! Would really like to see a close up of it. Thanks for sharing with SYC. Hi Julie, love your mantel with the apple theme and fall decor. Such a cozy style for the season. Your painting is beautiful above the mantel and so peaceful. You are so talented with all you create and design. 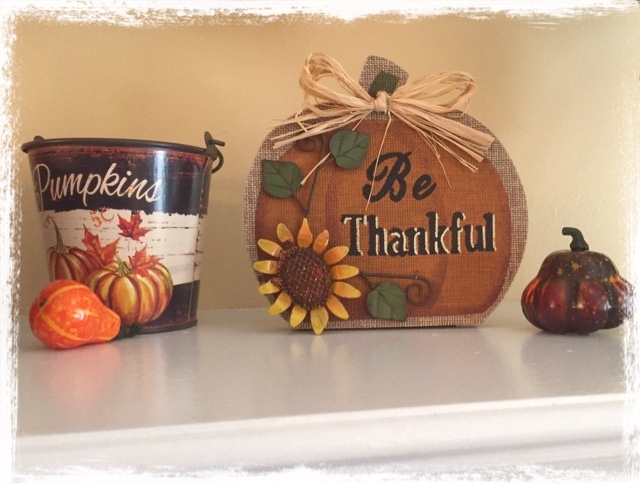 Thanks for sharing fall in your home. Have a great weekend. 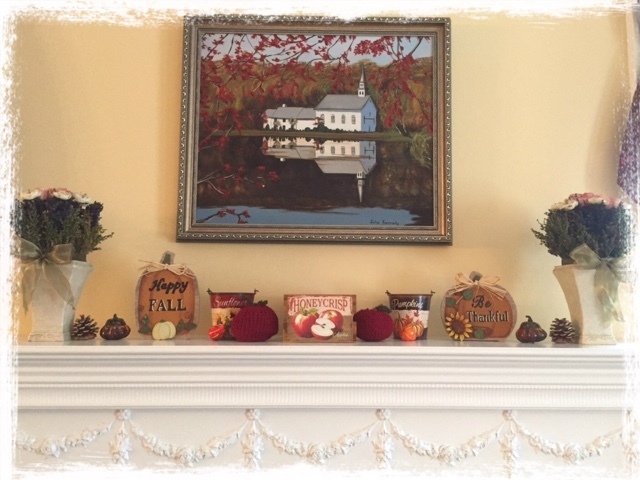 Your fall mantel looks lovely Julie! I admire all these fall decorations in our local craft store too, but the price tags make me leave them on the shelf. Your crocheted apples look very charming, and I think I like them best of all the decorations you have there. And that painting!!! It's beautiful with the church reflected in the water and those branches overhanging the top ... I tried to see it closer by clicking on it, but couldn't see it as close as I would like. You have a talent there that I hope you haven't put completely to rest ;) Enjoy your weekend! I didn't realize you painted Julie! I'm impressed, and the painting is lovely. Do you still indulge your love of painting now and then? Happy Saturday Julie. I love your fall mantel it is really cute. 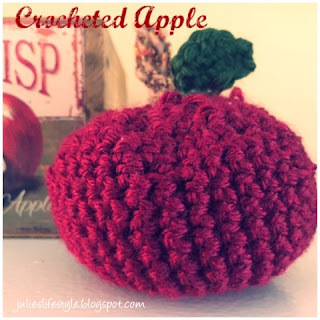 Love the crocheted apple just adorable. Your painting is beautiful!!! I learned something new about you! Your crochet apples and pumpkins are just too cute, and add so much to your fall decor!!! have a wonderful weekend! Your mantel is so, so cute, Julie. I may just have to learn to crochet now. I love your other accessories too especially the little buckets. Your painting is beautiful - it reminds me so much of a trip we took to New Hampshire a couple years ago. Looks simple and awesome ! Thank you for linking with us at #HomeMattersParty. We would love to see you again next week. 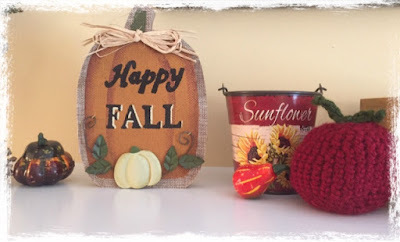 I just love the crocheted apples & pumpkins! Thank you so much for sharing at #fridayfavorites! Happy October, Julie. That was a lovely fall decor. Your crocheted Apple added a nice touch to the mantle. Enjoy the season!! 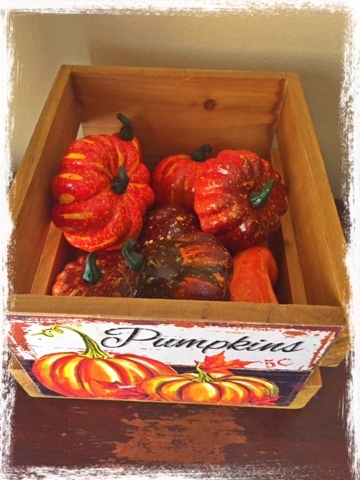 A very cute and cozy display of your fall lovelies, Julie; the apple is adorable! Happy Wednesday! Fall décor creates such a cozy feeling especially on the mantle. Love your crocheted apples. Everything looks so cozy. My inspiration for decorating comes from seeing all the nice décor around the blogosphere too.